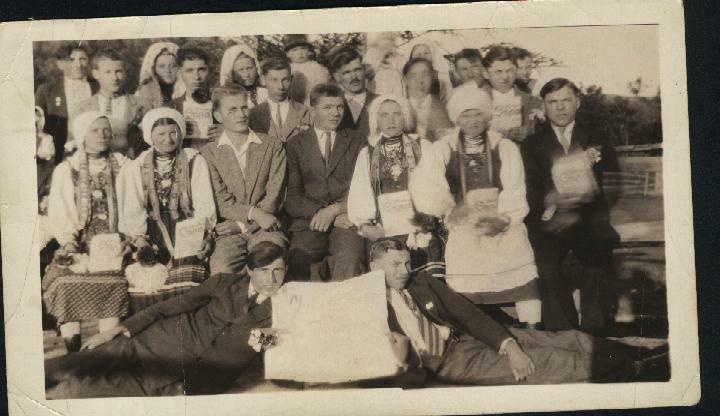 1933 pictures of Swiatkowa Wielka taken by my father, Fred Dran, when he traveled with his father, Michael Dran, on a visit to the ancestral village. 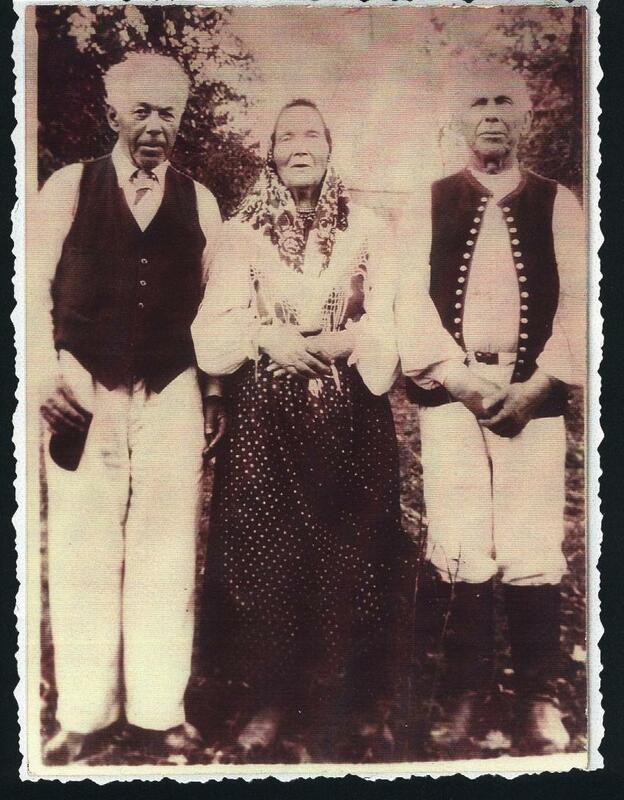 M ichael Dran (my grandfather) age 73, his sister Pelagia, age 72 and brother Demetri, age 69. A group of neighbors: Notice that many of them are holding a folded newspaper and the two young men in the front row are holding an opened paper. I have always imagined that this was a form of protest or of connection to something. If you read my father’s journal, at one point he and a cousin visit Lvov and he notes that there were two Ukrainian newspapers in the city. Perhaps he bought a paper for all of his friends and they are holding them to show the date the photo was taken. 1933 This is a cousin, Michael Dran (b.1918), son of D emetri Dran. Behind him is his older brother standing by the tree. 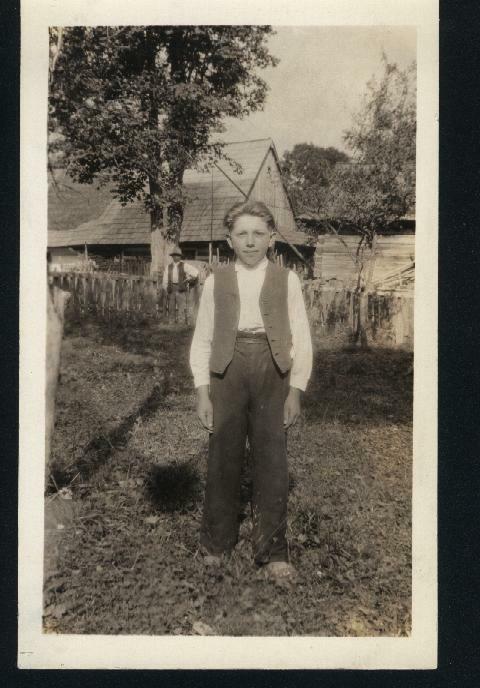 Michael immigrated to the USA about 1947.Photo gives an idea of the looks of a Swiatkowa W. back yard. S wiatkowa Wielka: View of the village church taken from the cemetery across the road. Church is St Michael the Archangel, a wooden church with tin roof, established in 1757 as a Greek Catholic church, now being used by Latin rite. The charm of Lemko churches results not only from their architectures but also from the materials used in their construction, the very substance of the wood material. These churches exist in harmony with the landscape. They are usually situated close to rivers and creeks. 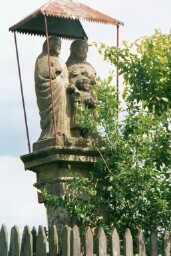 (St Michael’s is located on the banks of the Visloka river.). A circle of trees always surrounds them so that domes, cupolas and bell towers emerge through the foliage to present an impressive image. Churchyards are encircled by wooden framework fences covered by miniature shingled roofs.. Wrought iron crosses crown the roof-domes. 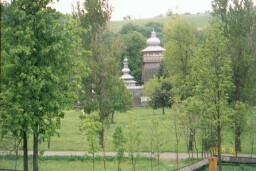 The church cemetery lies across the road. When the Lemkos were expelled in 1947, the Polish Army razed the gravestones in the cemetery, removing all evidence of their generational history. Only a few tall granite markers remain among the native grasses. Newer Latin rite graves lie at the back of the cemetery, leaving the vacant front of the cemetery as a memorial to the many souls whose ancestors inhabited the village for centuries. S wiatkowa Wielka. 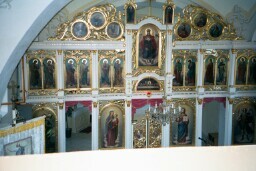 Icons on the interior walls have been restored. 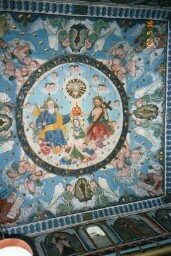 This is a view of a portion the ceiling. There is no iconostasis in the church at this time. The interior log walls of the building have been covered with canvas and the icons are painted on the canvas. Every inch of the interior is painted in a sort of medieval style. S wiatkowa Wielka. One of several family shrines in the village that were erected before 1890 when my grandfather left this village. Families erected shrines on their property to celebrate some great happening in their lives for which they praised God. All through Poland people still stop and say prayers at roadside shrines like this. 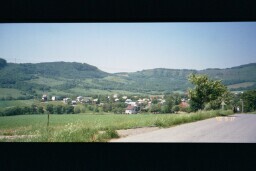 In May of 2002 I visited my ancestral villages and now share some photographs with you. 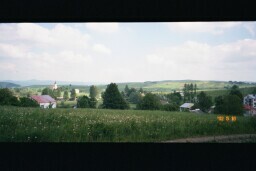 Views of the village of DUDYNCE: The road to Sanok is in the far background on the right in the first picture. T he village once had approximately 80 houses. Currently the village road is about one mile long, following a small stream. There are some twenty houses remaining, most of them built after WWII. The wooden Greek Catholic Chapel, The Synaxis of the Blessed Virgin Mary, established in 1802, was dismantled after the expulsion of Lemko residents in 1947. 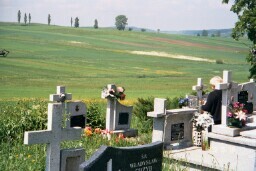 V iew of the Dudynce village farmlands from the Greek Catholic Cemetery. Many of the metal crosses on the graves showed evidence of bullet holes. From my interviews with present day villagers in 2002, I was told that there was much fighting among Polish, Russian and Ukrainian bandits in this area in 1947. Many houses were destroyed by fire. 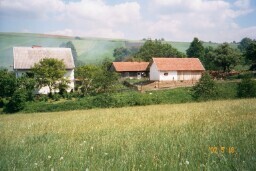 S ome log houses and barns still exist in Dudynce. Residents in this area have for generations whitewashed their houses. In May 2002 I visited my ancestral villages and now share some of the photographs with you. The village of HRABOVCIK on the south slopes of the Carpathian Mountains, now located in northeastern Slovakia, near the town of Svidnik . ( Use the back button to return to this site) Hrabovcik was originally a Rusyn village. H rabovcik: This is the view of the village as one heads down the main road. The nearest town, Svidnik, is two miles to the east. All of the homes appear to have been built since WWII. Click Svidník to learn more. 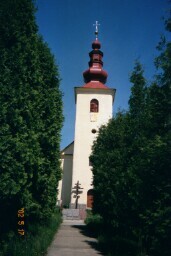 St. Michael’s Greek Catholic Church in Hrabovcik, established in 1812, has recently been restored. The construction is of stone masonry and stucco. The walls are about 3 feet thick and one has a sense of calm and coolness upon entering. My great grandmother Catherine Slota Siry was married in this church in 1878 and my grandfather Michael Siry/Sirak was christened here in 1885. The German army stabled their horses in the church during WWII. During that time, the priest lived in the church to protect the icons. Visit Rusíni , select fotogaleria, then Hrabovcik, to see other scenes of the village and church.